Love fresh-cut bouquets but hate having dead flowers after a few days? Me too. Sometimes they even get a funky smell coming from them… not the pleasant floral fragrance, but a stagnant swamp water kinda smell… Yep, that’s gross. Silk flowers can look nice if they’re done well, but let’s face it, the ones in my thrifty price range aren’t done well. So what are you left with? Paper flowers! I’ve been experimenting with paper flowers for a few months now and I’ve found success with a few patterns. To explain how well they turned out, I seriously considered using paper flowers at my wedding last August. Once you get the technique down, it wouldn’t be hard to whip up a few bunches for party decor, although it does take some time to make each individual flower. The best thing is that these can be made with regular tissue paper, floral wire, and floral tape. You can find these in so many stores that access to supplies isn’t an issue for anyone. 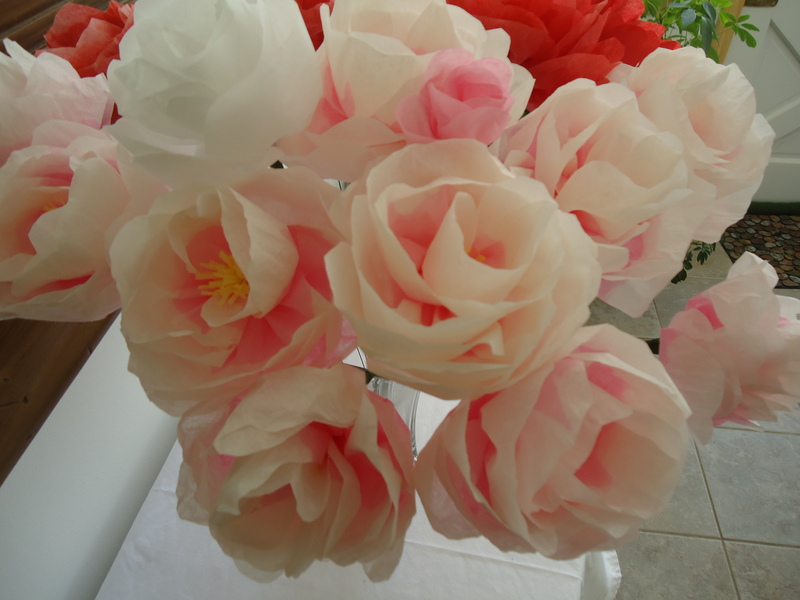 By far, my very favorite paper flower pattern is Martha Stewart’s Paper Peonies, as seen on her show. At first I was skeptical about bleaching the tissue paper, but it makes a big difference. Real peonies vary in color, often having a darker pink on the inside; bleaching helps you to achieve this. Not only that, but it will make people say “ooh” and “aah,” plus they’ll think you’re magical because they’ll have no idea how you did it. I also tried the pattern for the poppy but I ran into a few problems. 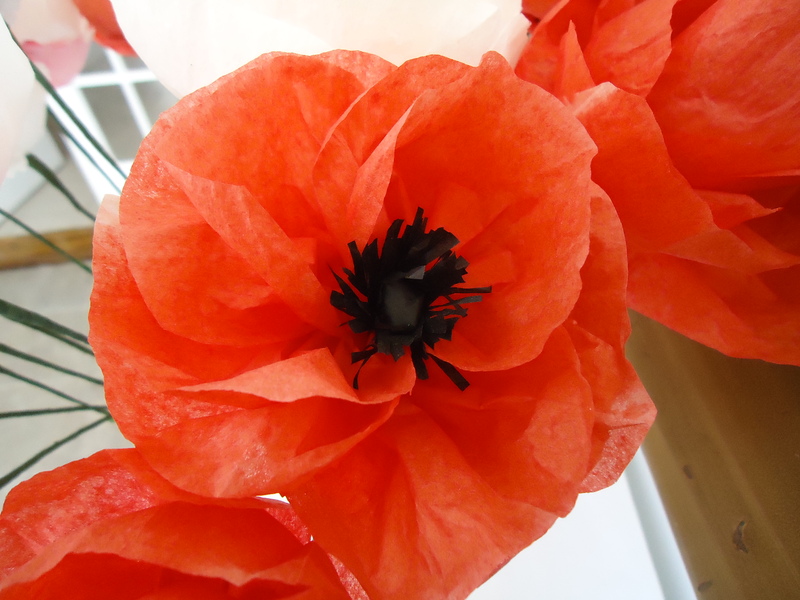 The pattern is based on an Iceland Poppy while I really want to create an Oriental Poppy. I tried using a vibrant red tissue paper for the petals and black for the center, but it just didn’t work. Ah, but that’s the beauty of DIY: you can change and customize everything! So I took the center from the poppy pattern but used the peony pattern for the petals. Perfect! I couldn’t find child-safe Q-Tips for the stamen around here (guess Westerly’s kids live dangerously) but I cut a small circle out of a makeup sponge and crammed that on the end of the floral wire. Seems to work. While Martha’s patterns often suggest you use fancy materials, you can get a little bit ghetto and your craft will still look ok. Don’t be afraid to try substituting something you have around the house. A bunch of tissue paper peonies. These poppies and peonies have been brightening up my kitchen for months now with no wilting or dying! I’m thinking about whipping up another couple of bunches since Mother’s Day is coming up. 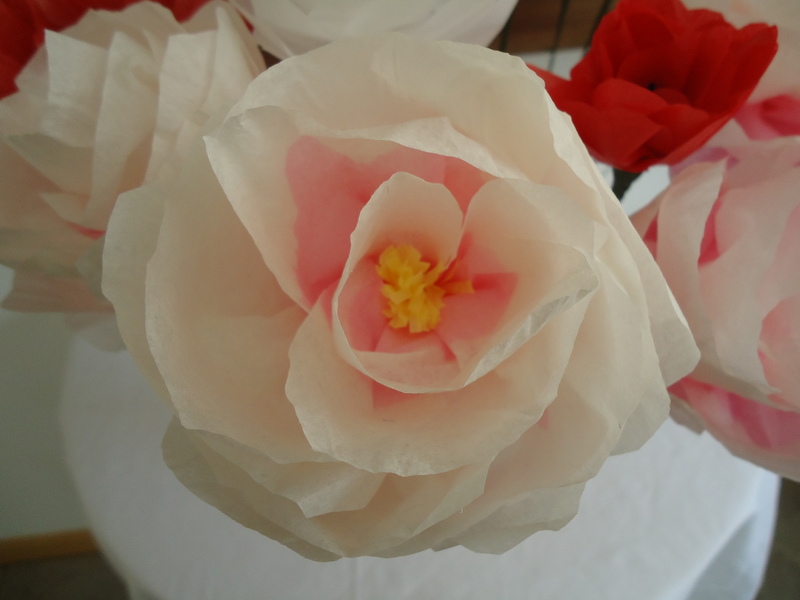 Instead of giving your mom real flowers, why not make some paper flowers? They’ll mean way more to her than a bunch of flowers from the grocery store, plus they’ll last way longer. 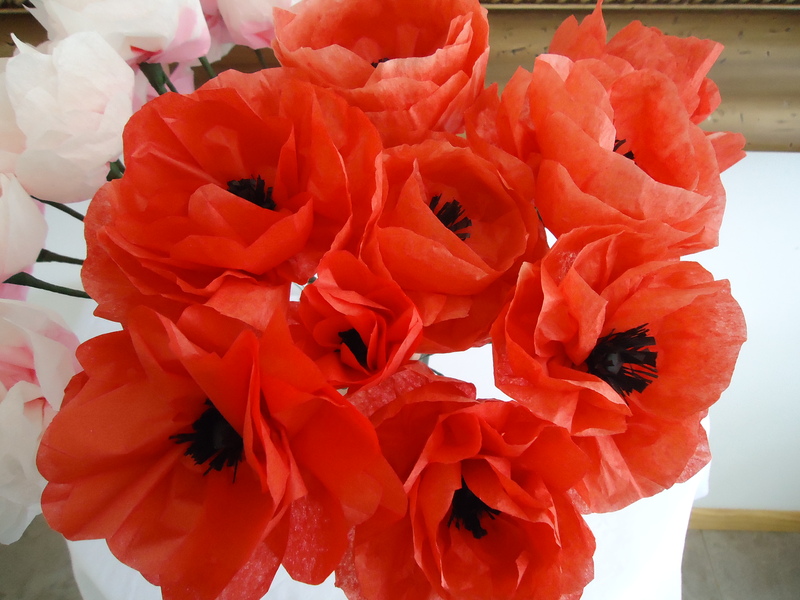 This entry was posted in From Others, Patterns and tagged diy mother's day bouquet, martha stewart paper flowers, mother's day gift, paper bouquet, paper oriental poppy, paper peony, paper poppy, tissue paper flower craft, tissue paper flowers, wedding paper flowers. Bookmark the permalink. 3 Responses to Paper Flowers! 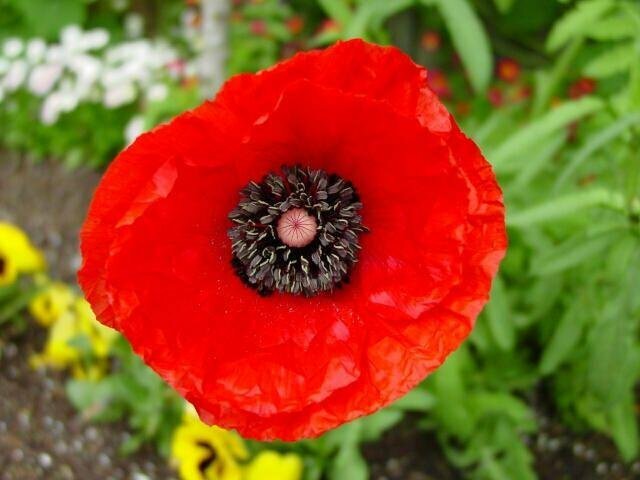 I LOVE the poppies you made – you are so right about the iceland vs oriental. They’re my favorite flower, but I don’t live near a place where they’re easy to obtain, and I want to use them for my wedding. I will be making these, with you fabulous substitutions! Thank you so much!